Before we knew her name, we called her Creepy Baby. Her name is Creeping Baby, Clockwork Doll, Automaton, Mechanized Doll or Robot. 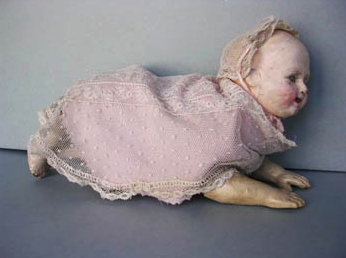 When wound with a key the doll appears to crawl, turning her head with each movement. Creeping Baby is just one of the many items in the Clinton County Historical Society collection. Creeping Baby had two patents. The first was granted to Robert Clay of New York in March 1871. The second was granted to his associate, George Pemberton Clarke in August 1871. In the 1870s, babies were said to creep, rather than to crawl. Crawling was what animals did. Babies crept. In April 2015, the History Center was contacted by DASA Arbeitswelt Ausstellung (World of Work Exhibition Center) in Dortmund Germany. The y requested a loan of Creeping Baby for an exhibit on “man-machines-robots.” The exhibit will show at DASA from November 2015 to September 2016, then at their partner, Parque de las Ciencias in Granada Spain from February 2, 2017 to February 2, 2018.